Access management for cloud resources is a critical function for any organization that is using the cloud. Role-based access control (RBAC) helps you manage who has access to Azure resources, what they can do with those resources, and what areas they have access to. RBAC is an authorization system built on Azure Resource Manager that provides fine-grained access management of Azure resources. What can I do with RBAC? Using RBAC, you can segregate duties within your team and grant only the amount of access to users that they need to perform their jobs. Instead of giving everybody unrestricted permissions in your Azure subscription or resources, you can allow only certain actions at a particular scope. When planning your access control strategy, it's a best practice to grant users the least privilege to get their work done. The following diagram shows a suggested pattern for using RBAC. The way you control access to resources using RBAC is to create role assignments. This is a key concept to understand – it’s how permissions are enforced. A role assignment consists of three elements: security principal, role definition, and scope. 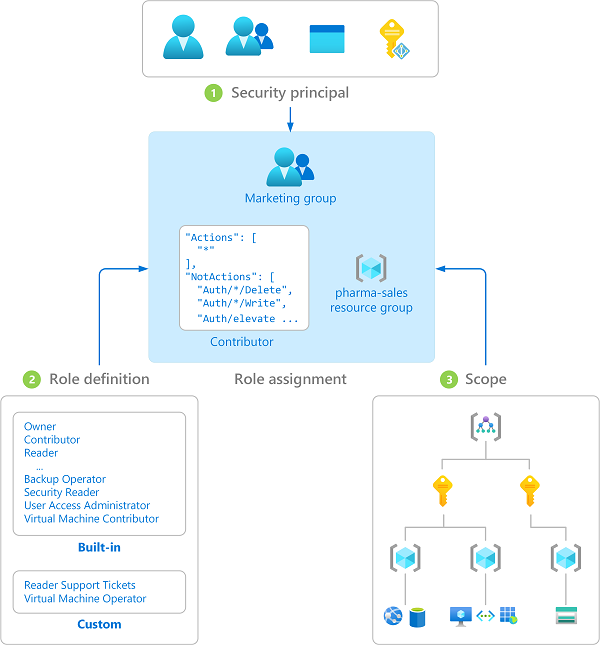 A security principal is an object that represents a user, group, service principal, or managed identity that is requesting access to Azure resources. User - An individual who has a profile in Azure Active Directory. You can also assign roles to users in other tenants. For information about users in other organizations, see Azure Active Directory B2B. Group - A set of users created in Azure Active Directory. When you assign a role to a group, all users within that group have that role. Service principal - A security identity used by applications or services to access specific Azure resources. You can think of it as a user identity (username and password or certificate) for an application. Managed identity - An identity in Azure Active Directory that is automatically managed by Azure. You typically use managed identities when developing cloud applications to manage the credentials for authenticating to Azure services. 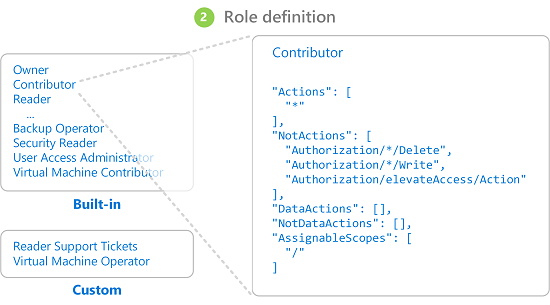 A role definition is a collection of permissions. It's sometimes just called a role. A role definition lists the operations that can be performed, such as read, write, and delete. Roles can be high-level, like owner, or specific, like virtual machine reader. Azure includes several built-in roles that you can use. The following lists four fundamental built-in roles. The first three apply to all resource types. Owner - Has full access to all resources including the right to delegate access to others. Contributor - Can create and manage all types of Azure resources but can’t grant access to others. Reader - Can view existing Azure resources. User Access Administrator - Lets you manage user access to Azure resources. The rest of the built-in roles allow management of specific Azure resources. For example, the Virtual Machine Contributor role allows a user to create and manage virtual machines. If the built-in roles don't meet the specific needs of your organization, you can create your own custom roles for Azure resources. Azure has introduced data operations (currently in preview) that enable you to grant access to data within an object. For example, if a user has read data access to a storage account, then they can read the blobs or messages within that storage account. For more information, see Understand role definitions for Azure resources. Scope is the set of resources that the access applies to. When you assign a role, you can further limit the actions allowed by defining a scope. This is helpful if you want to make someone a Website Contributor, but only for one resource group. 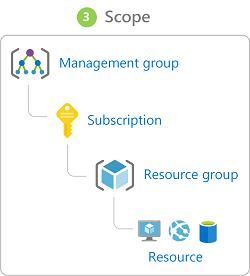 In Azure, you can specify a scope at multiple levels: management group, subscription, resource group, or resource. Scopes are structured in a parent-child relationship. If you assign the Owner role to a user at the management group scope, that user can manage everything in all subscriptions in the management group. If you assign the Reader role to a group at the subscription scope, the members of that group can view every resource group and resource in the subscription. If you assign the Contributor role to an application at the resource group scope, it can manage resources of all types in that resource group, but not other resource groups in the subscription. A role assignment is the process of attaching a role definition to a user, group, service principal, or managed identity at a particular scope for the purpose of granting access. Access is granted by creating a role assignment, and access is revoked by removing a role assignment. The following diagram shows an example of a role assignment. In this example, the Marketing group has been assigned the Contributor role for the pharma-sales resource group. This means that users in the Marketing group can create or manage any Azure resource in the pharma-sales resource group. Marketing users do not have access to resources outside the pharma-sales resource group, unless they are part of another role assignment. You can create role assignments using the Azure portal, Azure CLI, Azure PowerShell, Azure SDKs, or REST APIs. You can have up to 2000 role assignments in each subscription. To create and remove role assignments, you must have Microsoft.Authorization/roleAssignments/* permission. This permission is granted through the Owner or User Access Administrator roles. So what happens if you have multiple overlapping role assignments? RBAC is an additive model, so your effective permissions are the addition of your role assignments. Consider the following example where a user is granted the Contributor role at the subscription scope and the Reader role on a resource group. The addition of the Contributor permissions and the Reader permissions is effectively the Contributor role for the resource group. Therefore, in this case, the Reader role assignment has no impact. Previously, RBAC was an allow-only model with no deny, but now RBAC supports deny assignments in a limited way. Similar to a role assignment, a deny assignment attaches a set of deny actions to a user, group, service principal, or managed identity at a particular scope for the purpose of denying access. A role assignment defines a set of actions that are allowed, while a deny assignment defines a set of actions that are not allowed. In other words, deny assignments block users from performing specified actions even if a role assignment grants them access. Deny assignments take precedence over role assignments. For more information, see Understand deny assignments for Azure resources and View deny assignments for Azure resources using the Azure portal. At this time, the only way you can add your own deny assignments is by using Azure Blueprints. For more information, see Protect new resources with Azure Blueprints resource locks. The following are the high-level steps that RBAC uses to determine if you have access to a resource on the management plane. This is helpful to understand if you are trying to troubleshoot an access issue. A user (or service principal) acquires a token for Azure Resource Manager. The token includes the user's group memberships (including transitive group memberships). The user makes a REST API call to Azure Resource Manager with the token attached. Azure Resource Manager retrieves all the role assignments and deny assignments that apply to the resource upon which the action is being taken. 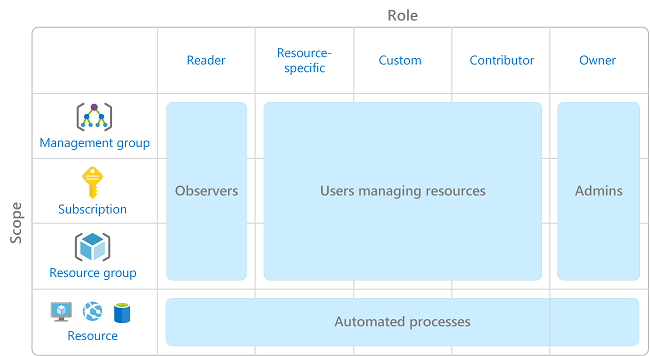 Azure Resource Manager narrows the role assignments that apply to this user or their group and determines what roles the user has for this resource. Azure Resource Manager determines if the action in the API call is included in the roles the user has for this resource. If the user doesn’t have a role with the action at the requested scope, access is not granted. Otherwise, Azure Resource Manager checks if a deny assignment applies. If a deny assignment applies, access is blocked. Otherwise access is granted.